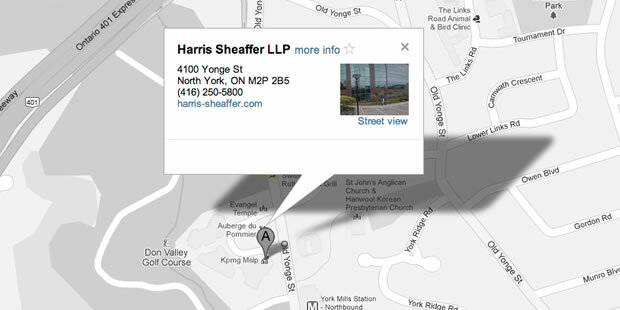 Harris, Sheaffer LLP is located in the Yonge Corporate Centre at 4100 Yonge Street, Suite 610, north of York Mills Road and south of the 401 on the west side. We are located in the most southerly of the 3 buildings. See map below. Underground parking is available in the Yonge Corporate Centre parking facility with a grace period of 30 minutes. Please note there is above ground parking, with no grace period. To access our building from the underground parking enter the door which you will see directly ahead of you at the bottom of the ramp as you enter the parking garage. The Yonge Corporate Centre also has direct access from the subway through a tunnel from the York Mills subway station of the Yonge Street Line.